(From Pentax lens literature) Ricoh Imaging Americas Corporation has announced the HD PENTAX-D FA 15-30mm f/2.8ED SDM WR lens. This new lens is designed to work seamlessly with the full-frame sensor of the new PENTAX K-1 camera. When mounted on the PENTAX K-1 camera body, the lens covers a focal-length range from 15mm ultra-wide-angle to 30mm wide-angle. (Note: with a PENTAX APS-C-size digital SLR camera body, the lens covers a focal-length range from 23mm to 46mm.) Its exaggerated ultra-wide perspective and state-of-the-art optical design enable capturing high-resolution, dynamic, sweeping views of subjects, ideal for landscape photography. Treated with PENTAX-developed HD Coating, the lens produces well-defined, fine-detailed images with ample light levels even at the edges of the image field, while effectively reducing chromatic aberration and distortion to a minimum. Special seals applied throughout the lens body provide this zoom lens with dependable weather-resistant construction, effectively preventing the intrusion of water into the lens interior. By pairing it with a weather-resistant PENTAX digital SLR camera body, the photographer has a durable, dependable digital imaging system that performs superbly under demanding shooting conditions - even in the rain or mist, or at locations prone to water splashes or spray. Quick-Shift Focus System for instant switching from autofocus to manual-focus operation, by holding the shutter-release button halfway down and turning the focus ring after the subject is captured in focus by the camera's AF system. HD PENTAX-D FA 15-30mm f/2.8ED SDM WR lens will be available in April 2016 at www.ricohimaging.com and retail outlets nationwide for a manufacturer's suggested retail price of US$1,499.99. 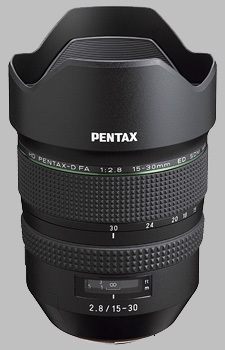 The Pentax 15-30mm f/2.8 ED D FA HD SDM WR doesn't have any user reviews yet!